The amazing power of music changes the patients’ faces one after another! 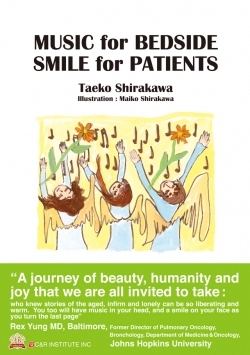 Wonderful and heartwarming stories that really happened in a hospital in a city close to Tokyo. One day, a hospital concert was whimsically organized by a woman doctor. Not only she but also all the hospital staff saw the amazing power of music that brought smiles to the patients. Thereafter, they repeatedly hold the original unique concerts. Duet by the patients and the doctors. Singing together with whole the audience, etc. 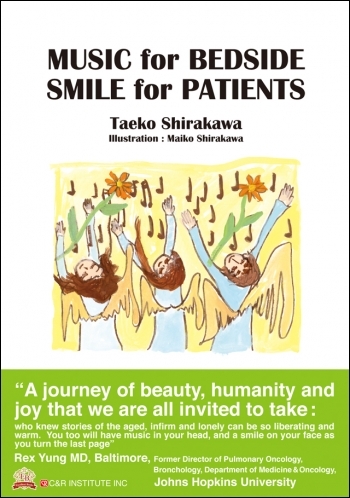 Vigorous and happy smiles of the patients, singing on a stage with full dress up! One patient was released from the strong lower back pain after singing her most favorite song. The woman doctor, who had recognized the great power of music, strongly wished to learn the piano again after long interruption. This book is the letter to her piano teacher to explain the reason why she wanted to take his piano lessons. You will find impressive stories of various patients who really enjoyed music in her hospital. ●Chapter 8　the melodies of the “nurse call” really are so wonderful! Born in Nagasaki city. Graduated from Kumamoto University, school of medicine. Entered to the 1st department of internal medicine of Kumamoto University. After the clinical experience at several affiliated hospitals, in 1993-1994, the guest physician of the Thoraxklink-Heidelberg, in Germany. After coming back to Japan, physician in the national hospitals in Kumamoto. At the same time, a member of the frontier working group for the development of the endobronchial ultrasound. In 2004, at the age of 49, got the degree of PhD. In April in the same year, was invited by the department of pulmonology of St. Marianna University School of Medicine, in Kawasaki city, as a clinical, education and research staff, and moved to Tokyo area from Kumamoto. Worked as the lecturer and vice director. In July, 2011, moved to Tama Hiyoshidai Hospital, where I started the hospital concert and experienced many music events with the patients. In April, 2014, moved to Toyoko Keiai Hospital as a head physician. This manuscript was written during working in this hospital. In June, 2016, came back to Kumamoto shortly after the “Kumamoto Earthquake”. At present, senior physician and pulmonologist in Konan Hospital in Kumamoto city. Started the violin after entering the university, and used to be a member of Kumamoto University Philharmonic Orchestra and Kumamoto Symphony Orchestra until pregnancy. After more than twenty year’s interruption in 2005, joined the St. Marianna Symphony Orchestra and re-started the orchestra activity. In April, 2015, started the piano lesson under Mr. Takehiko Ohnuma, after more than 40 years’ interruption. At present, a member of Kumamoto Symphony Orchestra. Publications: “the clinical ultrasound using bronchoscopy”, (co-author), Kinpodo, 1999, in Japanese, “the days in Heidelberg with my children”, Nihon Tosho Kankokai, 2001, in Japanese, “Music for Bedside, Smile for Patients” (the original Japanese edition), C&R Institiute Inc. 2016, in Japanese, and several others. Copyright (C) 2012 C&R研究所 All Rights Reserved.